Visit our own River Dance Lodge, a beautiful log cabin adventure resort just two hours east. 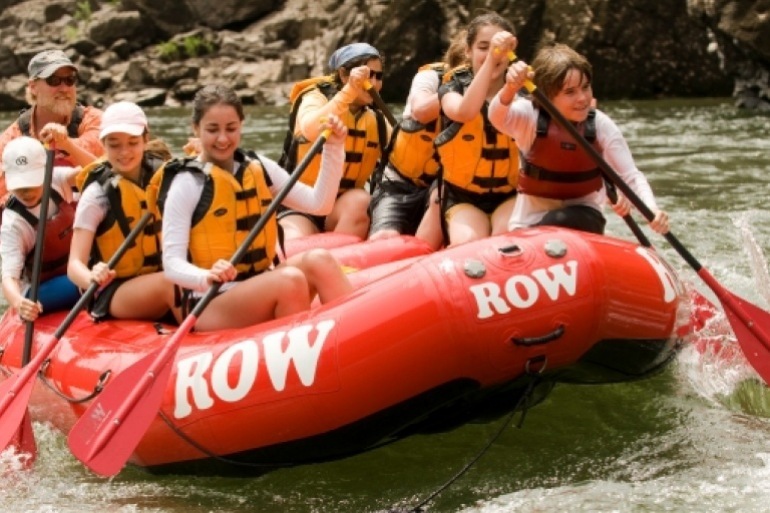 Designed by our family and field-tested by our own children, ROW's Family Magic rafting trips aren't just "family friendly" but totally family-focused. We bring an additional staff member, our signature "River Jester™", a specially trained guide who entertains children with nature hikes and games. The pace is adjusted with plenty of stops to play on the magical Salmon River beaches, explore Indian rock art and pioneer homesteads. Each evening a special children's dinner is served prior to the gourmet adult meal. Then it's time for a campfire and evening stories before settling in under the star-studded sky. Extend your stay in Idaho after your Snake River trip by visiting our own River Dance Lodge just two hours from Lewiston, Idaho where your rafting trip ends. Stay in a traditional log cabin with private hot tub, go hiking, fly fishing, horseback riding, mountain biking or just relax and enjoy the Rocky Mountain scenery. I just took my two kids on their Family Adventure trip down the Salmon River in Idaho for five days. Wow was it amazing! Not just the scenery and fun but the guides were superb as well! I've been telling everyone that will listen that they need to book this trip. Your trip is enriched by knowledgeable guides who share the canyon's cultural and natural history. We specifically train our guides in this area and most are Certified Interpretive Guides through the National Association for Interpretation.